Travel Utah in Your RV! Whether you want to plan a romantic getaway for two or you are simply in a place where you are ready to for some RV travel adventure, then Utah is calling you! Every year, more and more people are flocking to Utah to see what this beautifully lush and exciting state has to offer. Everyone who comes to visit Utah will leave with memories that they will never forget, and on top of that, some realize that they have found a home! When you are thinking about a vacation, there are lots of reasons to think about Utah; just take a look below for a simple sample of some of the great activities and sights to see. When you want to get away from it all, you'll see that Utah should be one of the first places to pops to mind. There are many different parks and national preserves that will let you kick the city dust off of your feet, and when it comes to natural splendor, Utah can't be beat. For instance, travel to Bryce Canyon National Park, which is just one of the gorgeous locations that are going to be available to you. You might want to hike the lonely trails or perhaps you would prefer the company of a guided tour. You may also take on the park by horse back. This national park is known for its breathtakingly clear night sky, and you will also be able to experience some gorgeous spruce forest and juniper forest scenes. Moab is the place for mountain biking, hiking, climbing, touring and river rafting in the Four Corners Utah area. Moab's Canyon lands and Arches National Parks, lodging, accommodations, tour operators and rentals. Moab is home to three Scenic Byways! Arches National Park is home to over 2,000 natural sandstone arches, including the world-famous Delicate Arch, and other unusual rock formations exposing millions of years of geologic history. Similarly, you will find that Lake Powell, located in the Glen Canyon National Recreational Area is perfect for house-boating. This lake has serene beaches, clear water and some of the most breathtaking red rock scenery that you can see. You can boat there, water ski, kayak and fish and the Rainbow Bridge is not to be missed. Zion Park is another park that offers you a great deal of natural wonder, but then it will also throw golf and other recreational activities into the mix. While Utah is very well known for natural wonders, also don't forget that it has some great opportunities when you want to travel to the urban centers as well. For instance, in Cedar City, you'll discover the Shakespearean Festival. People come from all over the world to take part in and view this amazing event, and whether you are a Shakespeare scholar or you just barely remember the important parts of Hamlet, you are going to be able to see some great drama in action. While in Cedar City, why not look at the Cedar Breaks Natural Monument? When thinking about what urban Utah has to offer in the way of travel, of course you can't forget about Salt Lake City. Salt Lake City is Utah's capital, and it is known all over the world for the ski resorts, its access to the national parks and its wonderfully equipped recreational areas Salt Lake City hosted the 2002 Olympic Winter Games, and it provides some of the greatest snow on earth! You won't run short of things to do whether you decide to visit the city by day or by night, and it is not for nothing that it is known as Utah's cultural center. There is no lack of things to do when you are considering travel to Utah. The Scandinavian Heritage Festival is found in Ephraim Utah, and it is perhaps the largest Scandinavian heritage event in the Inter-mountain West. You can catch up on your family's history or just learn a little bit about some of the people who settled this area. At the Utah State Fair, you will be able to check out the PRCA Rodeo, hear some current music and check out the Master Chainsaw Carving options. When you are interested in film, don't forget that Utah hosts the Sundance Film Festival. This film festival is the largest independent cinema festival in the country and it is the premier showcase for independent filmmakers. Also check out the Neil Simon Festival, held in Cedar City that is dedicated to the work of Neil Simon and his contemporaries. If you want your visit to travel Utah to be educational, make sure that you don't miss out on the Brigham City Museum Gallery. You can see some amazing exhibits, and at the end of the day, there is a lot to learn here. For instance, one of the most popular exhibits is the Trail of Iron, a photo documentary about the creation of the first transcontinental travel railroad. Check out the rotating gallery and the history selection. Eliza's Attic and the Homestead are both interactive exhibits that are perfect for families of all ages and sizes. When you are interested in travel to interesting places in Utah, make sure that you pay a visit to the Hole 'n the Rock House and Grounds in Utah. This is the place for families, travel groups and geology, and you'll soon see that the 5000 square foot home carved completely out of rock is something that you will never forget. There is a petting zoo on the grounds and you can see the unique cactus and rock gardens that are only a part of this house's charm. The Hole 'n the Rock House has been featured on programs like the Discovery Channel and National Geographic. Travel in Utah with your RV is an event that you will never forget, and whether you stay for a few days or a few weeks, you will never run out of things to do. This state has a lot to offer both in terms of natural wonder and urban entertainments, so don't miss out! 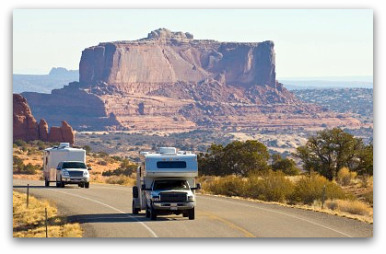 We found this great site that lists over 700 Utah campgrounds or RV Parks in Utah. You can search the whole state or any region you plan to travel to. Of course boon-docking in Utah is always fun too! Don't have an RV to travel Utah with? 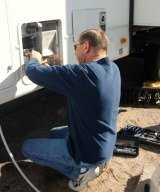 Check out RV Rental Utah.